Prejudice towards disabled people does thankfully seem to be less ingrained in people’s minds than other kinds of prejudice and discrimination. However, disabled people often have to contend with discrimination and prejudice on the basis of places not being equipped for their needs rather than because people are outwardly showing prejudice towards disabled people. 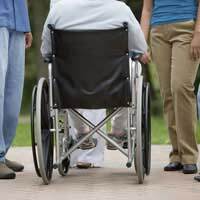 In addition, disabled people also may have to contend with a form of pity, often misplaced, which may masquerade as concern but can often be as prejudiced as outright discrimination. There are of course, the people who will still be prejudiced towards disabled people for no other reason that they don’t understand disability and struggle to comprehend that the world is full of many different people. Some of these prejudiced people will target people on the sole basis that they are in a wheelchair, some because the people have learning difficulties and some because they look different. It is astonishing to think that this goes on, but it does, and it is up to communities to show this will not be tolerated by creating a completely inclusive society. A lack of opportunities does not have to be a big thing to make it feel like prejudice towards disabled people. Basically, anything which stops a disabled person from going about their business in an ordinary way is discriminatory. Furthermore, people must be able to live their lives in a dignified way, just as able-bodied people would expect to do. So, for example, if a business only has steps access and people with wheelchairs cannot enter, this is prejudiced or discriminatory towards disabled people. The company might argue that their staff could come out to the person but this is hardly letting them go about their daily business with dignity intact. Therefore, modifications should be made so wheelchair bound people can use that building. This is a small example but illustrates the basic point. Anyone who is given less opportunity in a job interview is also being discriminated against. So, if, for example, a job interview consisted of something needing to be read, and a blind person was interviewed, this person would have to be given the chance to hear it on tape or something which gave them the same chance as a seeing person. This can be a difficult one for people to judge. Obviously, there may be times when a disabled person could do with a hand. But what people must remember is that the vast majority of people with some kind of disability get on with their lives perfectly well every day. Thus, you must strike a balance between helping out someone if they are in need or it with not being patronising, for this can be as prejudiced as any other form of treatment. Certainly, assuming someone cannot do a task because of his or her disability should not be an automatic reaction. What can be said about the people who commit abhorrent acts towards people on the basis of a disability? All we can try to do is combat it by making it clear that this is a socially unacceptable attitude to have and an unacceptable way to behave. The courts must decide the punishment but we must make it clear that there is no place in a right thinking society for such views. Prejudice towards disabled people, like other types of prejudice, is protected by law. Businesses must be inclusive of all people, customers or staff, regardless of any disability, and the penalties for those which aren’t are heavy. But for people who do something such as attack someone who has a disability, there is no specific crime, as there is with racially aggravated assault and the like. But a judge would be aware of any ‘motive’ or an excuse, and it is hopeful they would be firm on any perpetrators because of this. After recovering from a total knee replacement, I have experienced active prejudice by a car parking organisation who have refused to recognise my requirement for a disabled place on a single occasion and are actively pursuing a large fine against me.They have refused to recognise my condition and need for additional parking space ( I did not apply for a blue sticker as I knew that my condition was temporary - 12 weeks).In their claim against me, they have consistently refused to recognise my medical condition and I would like to know if any others have experienced similar examples. It may be worthwhile raising a Web Petition to get awareness of parking companies having a priority of income at any cost over the needs of disabled people. Since the London 2012 Paralymics I think there’s been a real shift in attitude. Where many often saw the disability rather than the person, now they see the person and the potential. It’s sad to note, but often, before this, so many wrote off the disabled as somewhat lower. At least that seems to be changing – finally. This is exactly what I have been looking for, thanks to this information I can do my assignment.